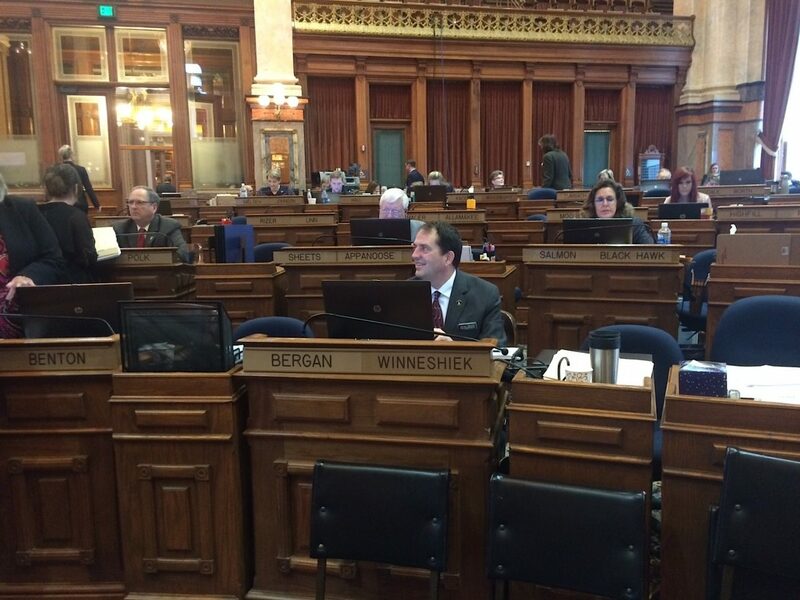 Iowa state legislators catch up on work during a break in the Iowa House after Gov. Terry Branstad delivered his 2017 Condition of the State and budget address in the House on Tuesday, Jan. 10, 2017. Iowa’s largest agencies would bear most of the proposed $110 million in budget cuts for the current fiscal year that Gov. Terry Branstad and Lt. Gov. Kim Reynolds sent to the Legislature on Tuesday, Jan. 10, for the 2017 legislative session. A little less than $25.6 million from the Board of Regents that oversees Iowa’s three public universities and schools for the deaf and blind and $8.7 million from the state’s community colleges. $20.3 million from the Department of Human Services. $15 million from the Department of Corrections. $7.7 million from the state’s judicial branch. $5.5 million from the Department of Education. $3.8 million from the Department of Public Safety. $2.5 million from the Department of Public Health. $1.4 million from the Legislature. Another cut of almost $13.9 million human services’ medical assistance program – Medicaid – is in the proposal. That raised questions at a morning briefing for reporters because the governor’s office said it would not cut Medicaid funding to make up for the reduced state revenue projection for the fiscal year, which ends June 30, that makes the proposed spending cuts necessary. Executive branch staffers said that amount is not a cut in Medicaid spending. It is surplus money in the state’s Medicaid program created by a combination of additional revenue from fees and other managed care revenue that had not been projected. David Roederer, director of the Iowa Department of Management, said he does not know if layoffs would be needed in the budget cuts. Branstad ruled out state employee furloughs in his address to the legislature. Roederer said some state departments have been leaving positions vacant when employees departed since fall in anticipation of a possible revenue shortfall. “They can see the numbers. This is a rough period,” Roederer said. Branstad’s office has identified $47.1 million in nonrecurring expenditures to help cut expenses, Roederer said. No plans exist in the fiscal 2017 proposal to close state facilities. The proposed budget adjustments include one proposed increase – $4.3 million for public defender spending.